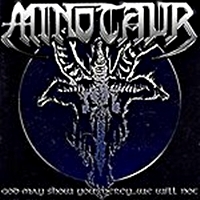 Germany's Minotaur was formed in 1983! After releasing three demos they released 'Power of Darkness' in 1988. Lack of originality and a bad production were the two main reasons why the band did not make it. 20 years later they are back with the new record: 'God May Show You Mercy....We Will Not'. Where a lot of other bands catapult their music into the sounds of today, Minotaur sticks to their roots. The songs are still fast and aggressive thrash songs with links to bands such as early Kreator, Sodom, Destruction (especially the song "Tales of Terror") and Deathrow. Fortunately the production is much better than back in the 80's. Vocalist Andreas Richwien sounds a lot like Mille (Kreator) with his screetchy high-pitched snarls. The solos on the songs are there, but don't add anything extra to the music. Most of the tracks are just regular thrash songs, never getting above average. The three handle their instruments well, almost all the songs bring the retro 80's feeling and in fact there is not so much wrong with that. But the question is, is the metal fans waiting for this? I had pleasure listening to it, but not more than that. In fact, I think the band will once more stick in the underground. Probably they do some local gigs and in Germany there will be some fans that enjoy Minotaur, but outside their home-country I don't think the metal fan will have any sleepless nights over them. Finally, the W.A.S.P cover "Animal" does not add anything to this CD. Perhaps food for old school die-hard German 80's thrash fans.